Fundraising for the Future History Center with Soup Bowls, Wine & Auction Items - Our second annual Soup Night is scheduled for November 7. The Soup Night committee has already received wine donations from a corporate sponsor. They are working hard on getting more of those special soup bowls as well as silent auction items for the event. We are hoping for an even bigger turnout this year in order to help pay for the planned renovation of the Old Library Building when it becomes available as our new site for the History Center. We are looking for people with Grant Writing Skills. The Historical Society hopes to obtain grant money to help fund some of the renovation expenses. Please let us know if you or someone you know has experience at writing requests for grants and would like to help. 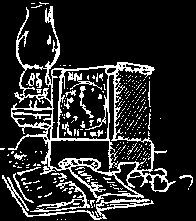 Website resources - Have you recently checked out the Historical Society website? 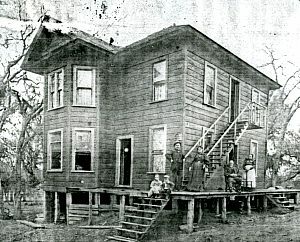 Click on www.fairoakshistory.org for a rich store of historical information as well as links to other sources. Topics range from Society Bylaws to Newsletter Archives, Fair Oaks Historical Maps, Old Fair Oaks Homes, Photo Gallery, and the e-mail address (located at the bottom of the main page) for posting questions/issues regarding the history of Fair Oaks. More help wanted - How would you like to get more involved in the work of the Historical Society? Opportunities exist for periodically serving as a docent at the History Center, assisting with membership registration, serving as a greeter at one of our general meetings or inventorying and caring for articles. I’ll look forward to seeing you at our July 22, 2008 General Meeting, starting at 6:00PM. Come and bring a dish to share. Invite a guest and introduce them around. Members of the first graduating class from Bella Vista High School (1963) will be making a presentation on what it was like to begin a new high school in the 1960s. Students that were only 14 and 15 years old when they were given the responsibility of setting up the student government, choosing the school colors, mascot, and writing the school’s fight song. They started out as sophomores, but were really the senior class for three years. They have memories of Fair Oaks and Bella Vista when Fair Oaks Blvd and Madison Avenue were two lane dirt roads. Besides the presentation at the July meeting, they will be having their 45th class reunion in September, which will include the first graduating classes '63, '64, '65, '66, and '67. Come to your class Reunion on September 6, 2008 at the Fair Oaks Community Club House. For more information, please contact Sherry Lynn Wood at (916) 944-4812. I would like to take this opportunity to thank Lee and Mary Scott for the slide presentation on the Murphy-Scott Building. Lee did a fine job speaking to the changes in the property over time. With the help of Jim Pearce on projector, Lee collected a number of wonderful photos of the Building and delivered a very informative and enjoyable slide presentation. October’s program will be a presentation on the history of one of Fair Oaks’ neighboring communities. The Memorial Day Ceremony at the Fair Oaks Cemetery on May 24 was very succesful. About 175 people attended. The program included the Village Singers, guest speakers and Honored Speaker John Serpa, PFC US MC WWll veteran. Visitors remarks indicated they really look forward to the cookies. A sincere "THANK YOU" to all who furnished cookies. A special exhibit of real photo postcards of Fair Oaks was on display at the History Center on July 13. Recent memorial donations for lone Radonich and Ike Merkey have been recieved. Their names along with the doner's name have been entered into our Memorial Book. Thanks to the following people for being docents this year. Meg and Larry Smart, Evelyn Heim, Lois Frazier, Diana Lennon, Gordon and JoAn Heidt plus Fran Sargent. THANK YOU! Fair Oaks Historical Society General Meeting Minutes, April 22, 2008. Following a wonderful potluck, President Ken Steen called the meeting to order at 7:00 p.m. Bob Barrett introduced the guests attending and the new members since the January meeting. Historical Moment: Lois Frazier provided the Historical moment for the evening. Lois shared pictures from Music and Drama events held at the local schools in the 1930’s (Madame Butterfly and The Importance of Being Ernest, and others) She also read a quote from Maddox Hogan, San Juan High School Music Director. Lois also remembered Orla and Lou Gerhardt, who arrived in Fair Oaks in 1928, they added many fine memories to the Fine Arts scene. Program: Vice-President Sherry Wood introduced Lee Scott, who with his wife Mary own the Murphy-Scott Building in Fair Oaks. 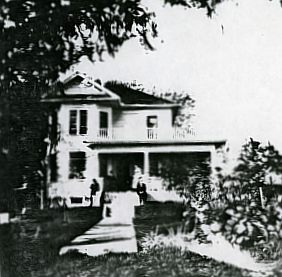 Lee started by sharing pictures of early Fair Oaks. Including the bridge and railroad station. The city plan was drawn in 1901, which was the year the Murphy Building was built. 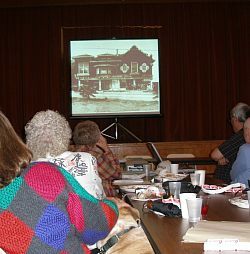 The presentation followed the changes to the building and the village through the years, by comparing several photographs. 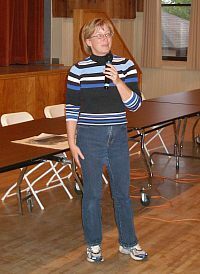 Special Presentation: Ann Dobek member of the Fair Oaks Horseman’s Group was introduced. Ann also introduced several members of the group who were in attendance. She shared with the group its history since it’s organization in 1972, then scrapbooks chronicling their history were presented to the History Center. 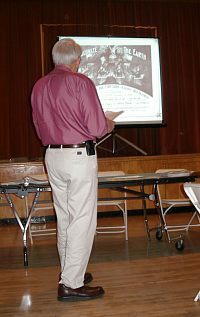 History Liaison/Past President: Warren McWilliams reported that we are hosting the Sacramento History Consortium on May 22. We are serving lunch, members are welcome to come. Warren also reported that some progress has been made in gaining space at the Fair Oaks Elementary School for the Park and Rec. District, if this happens the Old Library Building could be made available for the History Center. The minutes of the last General Meeting were approved as published in the Newsletter. Treasurer’s Report: Treasurer Joe Dobrowolski reported that our accounts were in order. Ways and Means: Marilyn Dupray reported that the raffle tonight brought in $201.00. Membership: Bob Barrett reported that we have 153 memberships, which equals 245 voting members. There are still many delinquent dues payers. Newsletter: Marilyn Pearce reported that extra newsletters have been printed for distribution at the Spring Fest. Publicity: Trude Vasquez reported that we have been getting good coverage in the newspapers. History Center Operations: Lois Frazier reported that the History Center will be open on both days of the Spring Fest. She also reminded us about the Memorial Day Celebration on May 24th at the Cemetery, at 10:00 a.m.. She asked for signups for cookies for this event. Website: Jim Pearce reported that we have started a photograph program, selling reproductions of our historical photographs. Ken reminded us to continue to check our website for new additions. Soup Dinner: Claudia Thorn and Lynn Steen reported on the Soup Dinner. The wine for the dinner has been donated for the event. Many chairmanships have been filled, help for a few key positions need to be filled. We were reminded to start working on getting silent auction items and gift certificates from grocery stores. Announcements: Sherry Wood announced that the next meeting will be July 22nd. The first graduating class from Bella Vista will be the program. We've pretty much completed work on three projects but never exclude the possibility of improvements. We contacted the Fair Oaks Chamber of Commerce regarding any old Fair Oaks photos they might have, and they kindly searched their storage area and found a folder with about 100 of them. While many were duplicates of what we have at the museum, a number were either new or in better shape than ours. For our part, we inventoried and scanned the photos, put them in protective sleeves and into a binder, and returned them to the Chamber. Thanks so much to the Chamber. 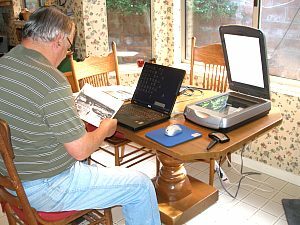 Jim finished selecting about 40 classic old Fair Oaks prints and put 8x10 matte copies in a binder for sale down at the museum. We're also open to providing the images on a memory stick so larger prints (up to poster size) can be made at Kinko's or other reproduction shops. We realized that Sue Burmaster and Marilyn Pearce have done such a good job on their "Old Homes of Fair Oaks" section in the newsletter that there is now a binder of their articles at the museum that will be added to as time goes by. It was available at the last open house, and we had a couple come by and give us information on their old Fair Oaks home. Please let us know if you have such a home and would like to share its history with the Society. 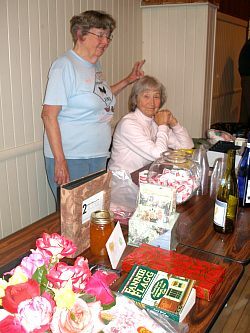 Left: Marilyn & Fran had a great raffle! Center: New members Donna and Hal Renollet with June Melvin and Larry Miller. Right: Ann Dobek, F.O. Horseman's Assn., shares their history. 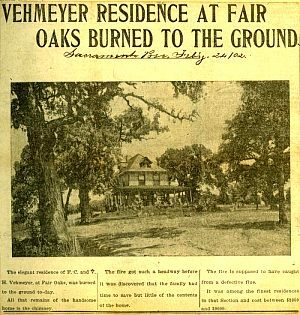 This edition of Old Homes of Fair Oaks is dedicated to all the old homes in Fair Oaks that were lost to fire; the first Slocum home east of the old library; the first Cunningham "starter home"; the Holst, Bailey and Vehmeyer homes; the Downing-Radke home (above) and of course the Buffum Mansion that burned in 1968. At times, in researching these old homes, it seems that half of them were destroyed by fire of razed for development. We're lucky to have what we have left. 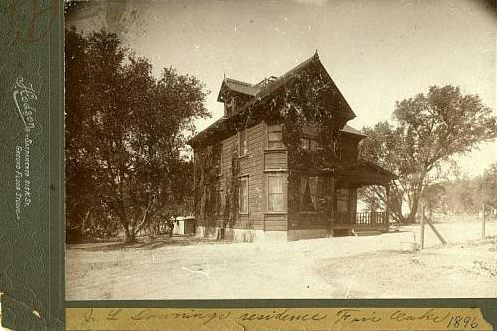 The interesting home pictured above was built by F. Smith for J. L. Dowling about 1896 and was one of the first houses constructed in Fair Oaks. As can be seen, it was added onto several times. It was purchased by Joseph Radke in 1906. He lived there until the house burned in 1936. 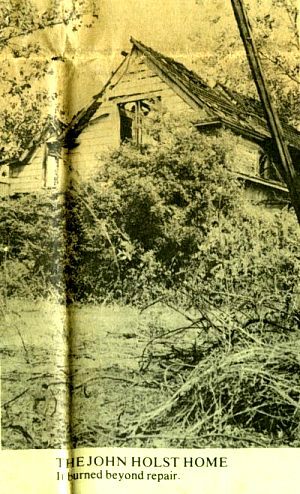 According to the San Juan Record, July 2, 1936, "The Radke home caught fire at 11 p.m. with Radke the only occupant at the time. Radke, who had made wood carving and gun collecting his hobbies, lost all his handiwork and gun relics, some of which were very valuable. Many keepsakes belonging to Mrs. Richard Codman, daughter of Radke were also destroyed." Although the location of the Radke home was not given in the article, a look at the 1910 census and the annotated 1908 map of Fair Oaks shows fairly convincingly that the home was on Fair Oaks Boulevard south of Sunset neighboring the Blanchard home, probably #45 on the 1908 map.